Yesterday, two more Syrian towns joined the ceasefire agreement, making for a total of 44 who have signed on. The number of armed groups who have signed the truce remains 42, but active negotiations are being held with three more. Consultations have been ongoing with Syrian opposition political parties, religious leaders, and public representatives in business and industry. The Russian monitoring group registered 10 ceasefire violations, including attacks on the Syrian army in Damascus and on Kurdish militias by the so-called moderate Free Syrian Army. It was an average day. However, today saw a threefold increase in violations, with 29 registered, mostly in Latakia, using large-caliber machine guns and mortars. Turkey continues to shell Syrian territory. The Russian Center for Reconciliation, which was set up in Aleppo yesterday, also went into operation, monitoring the ceasefire and humanitarian situation there. Meanwhile, a Syrian MiG-21 was shot down by a man-portable air defense system yesterday. There are conflicting reports about the fate of the pilots. One reportedly made it to safety, but the other died, either as a result of an unsuccessful emergency landing, or being shot and killed by jihadists in the vicinity. Jaish al-Nasr militants claimed responsibility for the attack. Today, al-Nusra killed about 10 people and injured 30 more in continuous attacks in Damascus and Idlib provinces. On Wednesday, militias allied with the Syrian Army ambushed a convoy of terrorists in the Sweida province, confiscating the weapons they were attempting to transfer to terrorists in the Eastern al-Badiya desert. Among the weapons left behind after the battle were mortar shells, land mines, RPG shells, ammunition of machineguns and Israeli-made LAU missiles. In a video uploaded to YouTube by the Executive Sharia Council in the Eastern Daraa region, a court established by al-Nusra in Southern Syria, Sharif As-Safouri, the commander of the FSA’s al-Haramein Battalion, admitted to having entered Israel five times to meet with Israeli officers who later provided him with Soviet anti-tank weapons and light arms, Times of Israel reported. 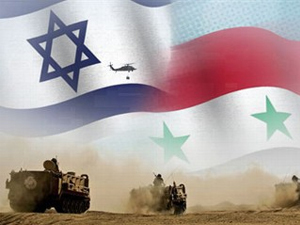 Safouri was abducted by the al-Qaeda-affiliated al-Nusra Front in the Quneitra area, near the Israeli border, on July 22. « The [opposition] factions would receive support and send the injured in [to Israel] on condition that the Israeli fence area is secured. No person was allowed to come near the fence without prior coordination with Israel authorities, » Safouri said in the video. While al-Nusra and the FSA have collaborated in the battlefield against Syria, friction has intensified as they began to implement their stringent version of Islam in the area, establishing local Sharia courts. Following the meetings, Israel began providing Safouri and his men with « basic medical support and clothes » as well as weapons, which included 30 Russian [rifles], 10 RPG launchers with 47 rockets, and 48,000 5.56 millimeter bullets. Harrison Koehli hails from Edmonton, Alberta. A graduate of studies in music performance, Harrison is also an editor for Red Pill Press and has been interviewed on several North American radio shows in recognition of his contributions to advancing the study of ponerology. In addition to music and books, Harrison enjoys tobacco and bacon (often at the same time) and dislikes cell phones, vegetables, and fascists.